Let the Good Times Roll. In this Market it always pays to Adapt. New wave rockers, The Cars, in their early hit: “Let the Good Times Roll,” sang about the carefree ways of the young. In a sense, the song is about going with the flow, adapting to the moment, and taking life one day at a time - “let them take you up in the air, let them brush your rock n’ roll hair.” And that roll with it attitude may be useful in this market, especially if the good times roll over in the next few days to weeks. Arguably, and perhaps for good reason, the good times vibe is not universal. There are still plenty of investors who remain on the sidelines, living in the recent past and licking their wounds after the fourth quarter’s massacre. And there is nothing wrong with learning the lessons of history, especially the lessons of such a painful period. Yet, from a trading standpoint you can’t take this stuff personally - you’ve got to know when to let go. And until proven otherwise, it makes sense to stick with what’s working right now, which is to be long stocks in the right sectors. Currently that means owning select semiconductors (TXN, AMAT, MU), biotech, (BIB), and select international ETFs such as the IShares Brazil ETF (EWZ). This combination of influences makes for an interesting decision point for those investors who have been skeptical of the recent bounce in stocks and have missed the opportunity to accrue sizeable gains in a short period of time. Accordingly, given that there is so much lingering doubt about this market, and with so many having missed the rally, it seems as if it still has some upside left. Of course, there is no guarantee that stock prices will continue to rise. And yes this rally will eventually roll over. But for now, the path of least resistance seems to be up, although the potential for daily volatility is likely to rise with earnings season moving into full swing. But it’s more about what happens after earnings than the earnings itself as investors will start to focus on revenues and forward guidance. Moreover, since time heals all wounds, the longer the bears get whipped, the lower will be the odds of a return to the bearish trend and the higher the odds that money will continue to move into stocks at least in the near term. This is especially true given the way that robot trading algorithms accentuate the major trend of the moment, which is up. The New York Stock Exchange Advance Decline line (NYAD) has been the most accurate indicator of the general trend in the U.S. stock market since the 2016 presidential election. It certainly and correctly predicted the decline in stocks over the fourth quarter on 2018. Thus now that NYAD crossed back above its 200 day moving average investors should pay close attention to what happens next. If the advance decline line consolidates or moves further above this line, it would signal a sustainable return to a bull phase in the market. By the same token, a failure of this crossover to hold would likely signal that stocks are once again heading lower. 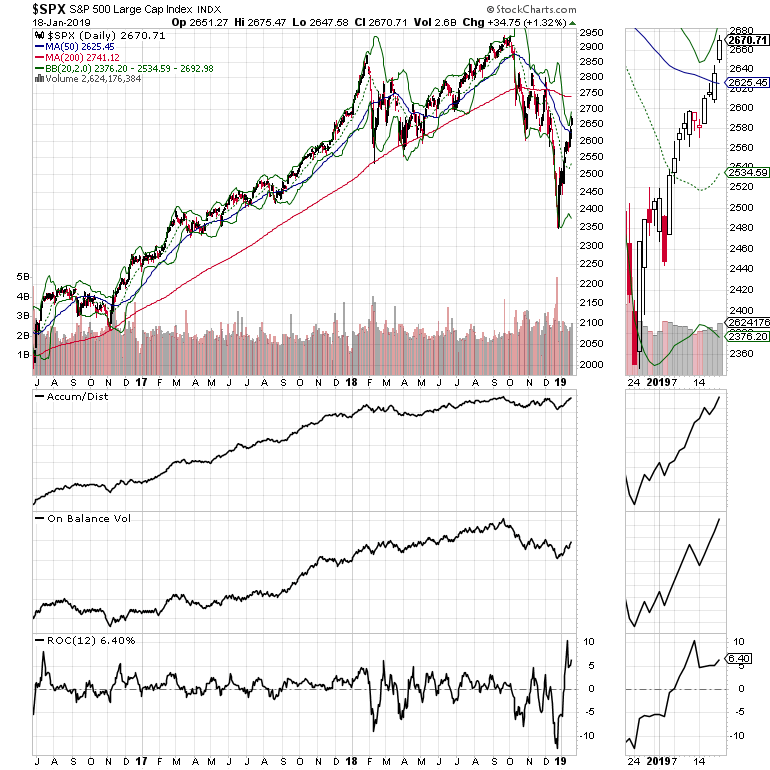 The NYAD has crossed above its 200 day moving average but the S & P 500 (SPX) and the Nasdaq 100 (NDX) indexes have not confirmed this event, although they are within reach of the key chart point. 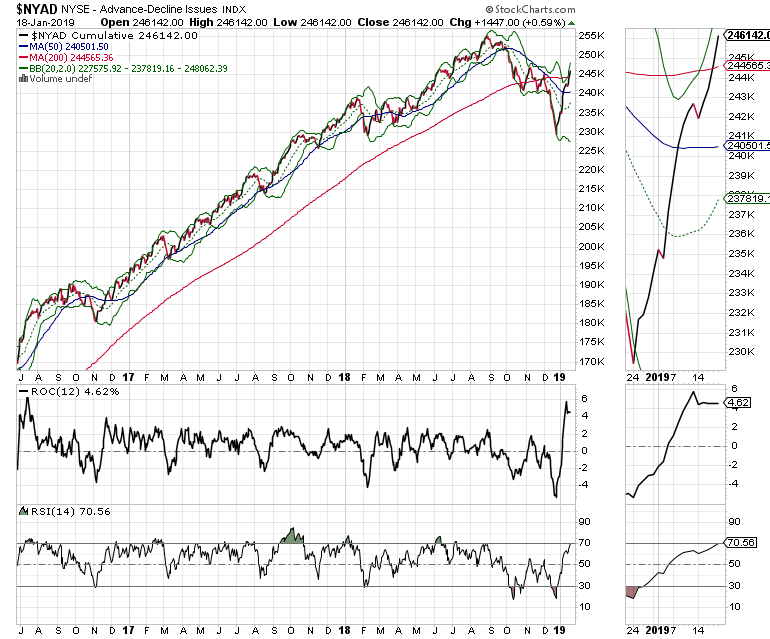 Furthermore, both SPX and NDX have crossed above their 20 and 50 day moving averages which is encouraging. Nevertheless this sets up a conundrum for technical investors. Certainly NYAD has been the more pivotal indicator since November 2016 but at some point, it would be comforting to see the indexes confirm the uptrend. 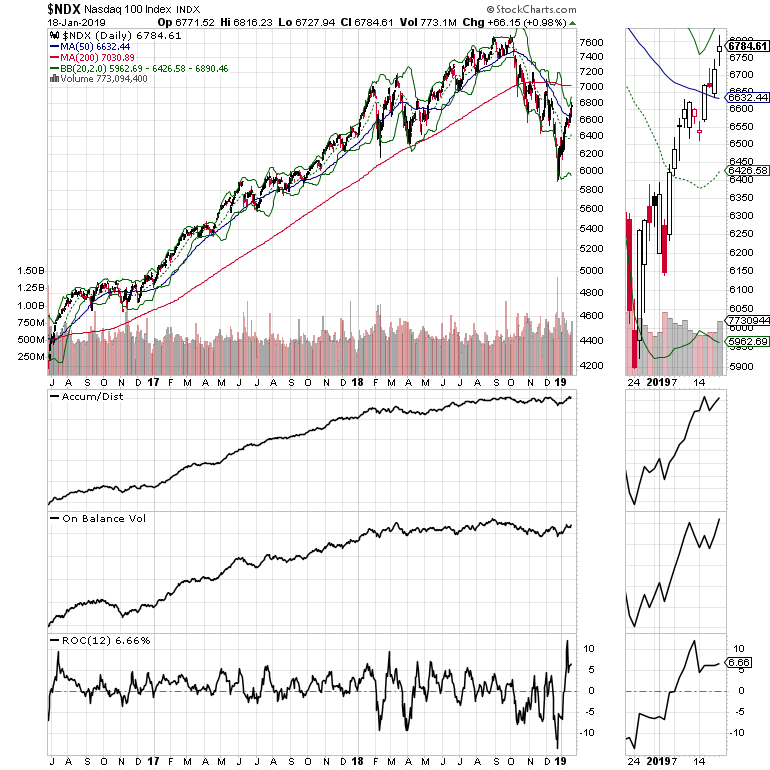 Specifically, I am focused on SPX and NDX and their 200 day moving averages because most human technicians seem to ignore this traditional dividing line between bull and bear markets but the robots don’t. In fact a review of the SPX chart clearly shows that during the Q4 decline, the index tried to remain above this key long term moving average three separate times. On the third attempt it failed and the selling accelerated. Thus I expect a challenge of that key resistance level before the market makes its intermediate term decision. Together, these charts suggest that we are still seeing hesitation from investors to fully return to this market broadly, but that they are moving into select areas with a great deal of momentum. The market may no longer be in a true bear phase, although given the number of geopolitical bombs that could explode at any moment things could change rapidly. Still, the fact that the Fed is on hold has reversed money flows into select areas of the market. Among the best performers remain the technology stocks, with stocks such as Micron Technology (NSDQ: MU) and Applied Materials (NSDQ: AMAT) along with a select group of international ETFs such as the Brazil ETF (NYSE: EWZ). So by sticking with what’s working and keeping tabs on the geopolitics and the Fed, those with patience to sort through the charts, the stories, and company fundamentals have a chance in this market for now. I own MU, AMAT, and EWZ as of this writing.